Do you remember when you were a kid and your imagination wasn’t limited by the laws of physics, gravity and the like? 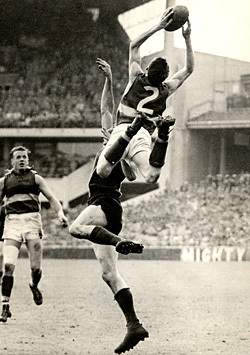 The above drawing by my little brother Pete embraces this freedom in creativity as he imagined his Footscray hero, Danny Hargraves, floating above the pack and plucking a grab in the square. 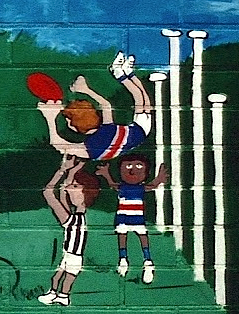 I have to say it also bares a remarkable likeness to the famous mark by taken by Footscray’s Merv Hobbs in the 1961 preliminary final. 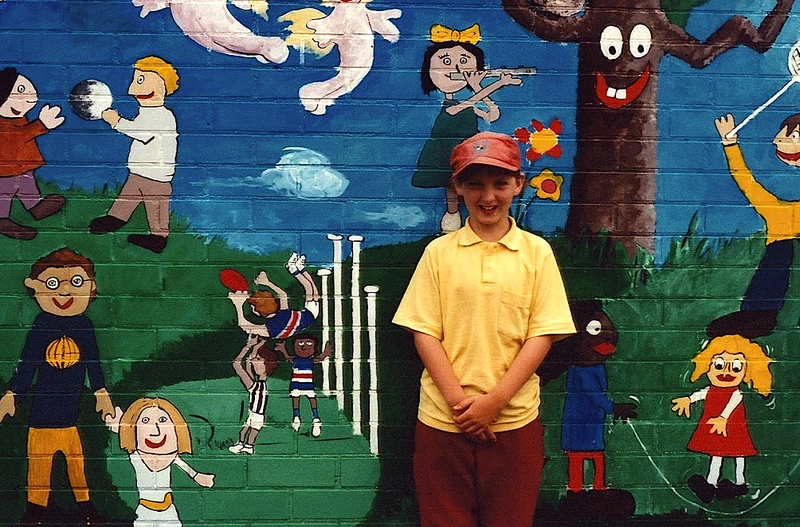 What was a bit special about this drawing however was that it was ‘immortalised’ upon the dunny wall at Blackburn primary school, the same dunny where I had my 1991 BPS premiership photo taken. Amid flutes, skipping, flowers and trees, all lovely, sits this footy gem, or at least sat. The toilet block was demolished some years ago. The giggling artist, 1997, as a 10 year old Doggy fan in Melbourne’s leafy east. A broader shot of the dunny wall, which was basically included to show how mangy the rubbish bins were! And I show you this picture as a source of inspiration. I am currently collecting peoples footy drawings that they did as kids, or drawings their own children have done, for an upcoming post. I have already received some cracking entries, and would love to see your drawings too, with any back story you may have. Please contact me on twitter @TheHolyBoot or by email-john@cherrystone.com.au. 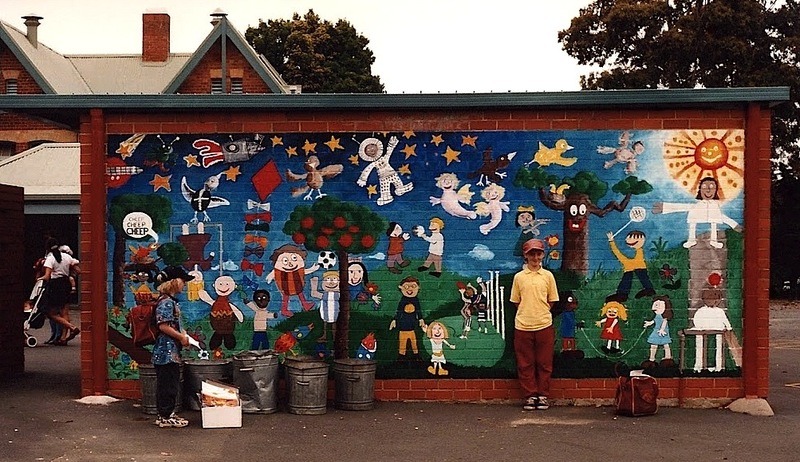 This entry was posted in Boots Happy Snaps and tagged @carr_pete, afl, Blackburn Primary School, Danny Hargraves, drawing, dunny wall, footscray, Footy, imagination, mark, screamer, speccie by theholyboot. Bookmark the permalink. My brother barracking for Footscray is still a bit of a mystery. It’s not as if he’s defiant or stubborn. One Sunday arvo, early 90’s, Footscray v the Bears was on the telly from Carrara. Pete was 4 or 5, and dad, unable to remain neutral, said ‘Go Dogs.’ Well Pete started copying him…AND IT STUCK!! I now live in Footscray, and have a definite soft spot for them, was never one for ‘2nd teams,’ but they really are. And yes, the Danny Hargraves angle is very my brother. Richmond’s had a number of promising stars do the same thing…Justin Plapp the poster boy!